Adler Barbour | Ocean Options, Inc. Performance, efficiency, and quality are all hallmarks of dependable marine refrigeration by the Adler/Barbour Series. The versatility provides for all freezer or combination refrigerator/freezer systems. Adler/Barbour's popularity today has grown from its proven and extradordinary ability to perform efficiently in a wide variety of installations. Its uncompromised quality has become the standard by which other systems are measured. 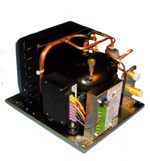 These units are unmatched in performance and efficiency and specifically designed to survive the rigors of the harsh marine environment: heat and humidity, erratic or low voltage, and continuous use.